one of the things we were invited to do as part of introducing ourselves to the rest of the group in jen lee’s session, truth & consequences at SAW, was confess something. my confession was that i love journals & have a stack of them. i love beautifully made paper, gorgeous colours and patterns and journals and often will buy one simply because i like the colour of the cover or the feel of the paper inside. …MOST of them are empty. their pages wait to be filled in with imaginings, dreams and the rainbow of colours that is my life. they taunt me with their blank pages, my mind is constantly attacking me for not being one those people that journal. i’ve never kept a daily journal, aside from writing morning pages (which are more like just-try-and-get-them-done-sometime-today pages for me). there are cheap journals in here purchased on our last trip to the usa as i love the sound and the feel of the pages AFTER they are covered in writing (is that weird?). these, i use for my morning pages, as they didn’t cost much and the pages fill quickly so i can get my krinkly feeling/sounding paper fix almost immediately. my current one is covered with the goddess leonie’s how to be a goddess artwork (which you can download for free from here) to give it some pizzaz. the other journal standing up, in the photo above, is my vision book. this was created at one of christine kane’s retreats & has been added to as i continue my journey & create my vision for my life. this one is filled with images, words, recipes and ideas for what our perfect home looks like. other journals in this collection have been given to me. i will carry one around in every bag, everywhere i go. some have a couple of pages written in (i always start writing in my journals from the back – again, weirdness), then nothing. blank. a chasm of empty pages from the beginning to very near the end. 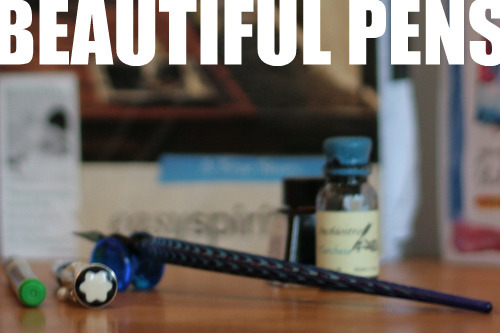 one, a beautiful glass pen, was purchased directly from the maker on murano island, venice. i have turquoise & deep red ink sitting at the ready. even these three beautiful items fail to fill the pages, as my mind freezes up and they sit limply in my hand, waiting for instruction. i’ve bought second-hand books with the intention of creating my own journals and i’ve got a box of assorted papers, collected for the pages – hoping that i can find some instructions for making a journal by hand, as i missed christine & marisa’s class at SAW. i also like the pages to be perfect (anyone else with me on this one?) – i don’t like scribbling things out and will often cut out a page and start again (or recycle the journal & get another) rather than leaving a spelling mistake or a change in thought scratched out on the page. 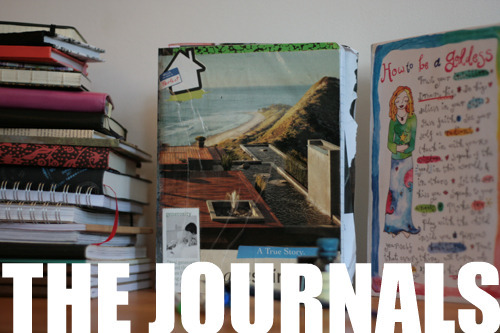 i’ve never tried wreck this journal, though something right now is calling me to do so as soon as possible! since jen’s class, i’ve been thinking a lot about why i don’t write. why my journals gather dust on the shelves. i’ve got a pocket-sized writing down the bones book that has leapt out at me this morning, and the words just sit and see what comes out sloshing around in my head. i guess, this is what wanted to come out first. This entry was posted in a book of days and tagged confessions, journals, writing. Bookmark the permalink. I LOVE them ~ using and collecting! My mom read my diary when I was 17, at a *very*risky*time* ~ and a big secret of mine was found out. I was severely chastised and punished. It is still a traumatic memory. I keep an ongoing journal at home ~ and also one in my handbag. Lately I’ve tried some doodling and drawing to give my words a different dimension. I also write in a different color each day based on my mood (although the past few days have been boring black ballpoint ink…hmmmm…). Here’s to the love of journals!!! Such a familiar situation! Like you I have many, many journals, some of them with only a few pages written in…and of course moleskins – lots of those too! (no fancy pen and ink, however). And I rarely write in them – I can’t stand the cross out words bit either – I tear out the page and start over. For this reason, I can’t bear the thought of “wreck this journal.” And even though I have all these unwritten-in-journals, I still buy more. I think my phobia of writing in journals stems from 1995 when a very jealous, possessive boyfriend read my journal and inferred things that were not strictly true.